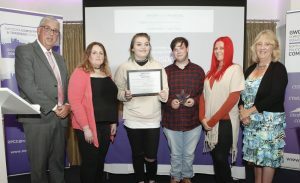 Gwynedd charity GISDA honoured for work with homeless young people | News by Wales Express News, People Before Profit! A Gwynedd homelessness charity which has seen its workload rocket by 2500 per cent since its foundation almost 40 years ago has received a special award. GISDA, based in Caernarfon, were presented with the Welsh Language Champions trophy by North Wales Police and Crime Commissioner Arfon Jones at his annual Community Awards at the Kinmel Manor Hotel, Abergele. North Wales Police and Crime Commissioner Community Awards. Pictured:The Welsh Language Champions were GISDA from Blaenau Ffestioniog, and pictured with North Wales Police and Crime Commissioner Arfon Jones Deputy Commissioner Ann Griffith are, from left, Elan Lewis, Daisy Roberts, Sian Morris and Daniel Price. The social enterprise organisation, which provides support and opportunities for vulnerable people aged between 14 and 25 in Gwynedd, were nominated for the award by the Commissioner’s deputy, Ann Griffith, for their work in Welsh – and English – in steering youngsters away from a life of crime. GISDA – it stands for Grŵp Ieuenctid Sengl Digartref Arfon – Young, Single, Homeless Group of Arfon – which dats back to its formation in the 1980s in Caernarfon. GISDA Head of Services Gethin Evans said: “We were founded in 1989 to help deal with a homelessness emergency of 12 people – almost 40 years on and we deal with almost 300 people a year. “But we don’t just deal with homelessness issues and to get this kind of recognition is amazing and especially as over 60 per cent of our service users are Welsh language so it is vital that we can support them in the language they feel most comfortable in. “People are referred to us by Social Services but they don’t have to come, it’s voluntary, so it is a positive that they do. “This vital support was delivered with ease in Welsh and the drop-in service I visited also embraced English speakers. “It was encouraging to listen to the young people who when they first turned to GISDA may have had complex needs and it was evident that they had taken the opportunities given to boost their communication and social skills to equip them for independence, building relationships and fulfilling work. Commissioner Jones, a former police inspector, felt it was important to recognise the efforts of often unsung heroes in the community. He said: “One thing all our winners have in common is that they make North Wales a better and safer place to live and work.